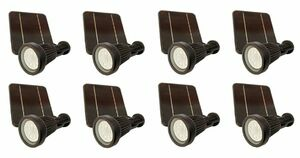 Easily Illuminate landscape features and outdoor areas around your property with the 8 Piece Residential Pro Series LED Solar Spotlight Landscape Lighting Kit. Perfect for Area Lighting, Residential Up-Lighting, Monument Lighting, Sign Lighting and so much more! Is the Pro Series Waterproof? It is not listed as such in your on-line product literature. Yes, the lamp fixtures are designed to be installed permanently outdoors and are weatherproof. Please note they are not designed to be submerged. Thank you for your inquiry! since it has the ability to change colors w/ a remote, does that mean you could technically make each spotlight a different color with this remote? I am thinking of buying this 8 pc kit but want to break it apart for 3 locations, all of which I may want a different color. Also, they are not attached to each, are they? the cord is for each one going to the solar panel, and there is a panel for each light, correct? Thank you for contacting us! Those are all great questions. Each fixture, will be able to output a different color. The fixtures are all individualized, they will come with their own panel and light head per fixture. For example, 8 lights, 8 solar panels. Each individual fixture will have its own cable connecting both the light and solar panel together. Thank you for your inquiry! I have three questions about this product. First of all how long do these solar lights last in the dark before they go out? How bright are these lights in there cool setting mode when it comes to there kelvin temperature? Last but not least how weather resistant are these solar lights when it comes to there IP rating. Thank you. The light fixtures operation time varies based on setting and exposure to direct sunlight. At the lower brightness outputs you can see up to a 12 hour run time with sufficient direct sunlight. At peak brightness one can expect 5-7 hours of run time with the fixture designed to slowly dim as the night goes. Brightness: Selectable 110, 180, 270 and 340 Lumens at 2700K. They are designed to be outdoors and will withstand normal weather conditions (rain, sleet, snow, etc). Thank you for your inquiry!